An Ideal Client Profile (ICP) is a detailed description of the clients who would benefit most from your product/service. These clients are more likely to buy in to your vision, advocate for you, and ultimately stay a long term profitable client. Knowing your ICP means it’ll be easier to bring in more high value business that STAYS and ADVOCATES for you. As well, because you truly understand your market and their pain points, it is easier for you to improve the product/service in a way which keeps your clients happy. Learn the 8 steps that every sales team needs to implement in order to launch a profitable and scalable LinkedIn & Social Selling program. Social selling is becoming a vital source for prospecting, lead generation, client engagement and service. In fact a recent study of over 500 B2B sales professionals found that 72.6% of sales professionals that use social media outperformed their peers that don’t. In this fast paced seminar Shane Gibson will help you and your team to profitably and efficiently integrate social selling into your sales process. The revenue model is your strategy to earn income and generate profits, while the Go-to-Market (GTM) plan is the specific tactics you use to carry out the strategy. Every business should periodically evaluate its revenue model and GTM plan to ensure they are achieving maximum results in the most efficient and cost-effective way. In this event, you will learn over 20 potential ways to generate revenue and how by either selecting a better model or optimizing your existing strategy, you can achieve sales acceleration and better profit margins. New models will be included as well as proven frameworks like online, channel, direct, telesales, and hybrids. We will also discuss when it is better to optimize your existing model and how to do so. You will also learn about how pricing and packaging are two powerful tools that you can deploy to generate more revenue and achieve competitive advantage. Examples of companies that have achieved fast sales acceleration will be shared as well as proven strategies to quickly implement your new or optimized model. The overall goal of this event is to help you generate greater amounts of revenue, faster and more predictably. 1.How to diagnose the strength of your existing revenue model. 2.Best ways to quickly achieve sales acceleration. 3.How to optimize your pricing and packaging. 4.Tips to successfully implement your new or revamped model. 5.Methods to test a new model without disrupting your existing revenue stream. As a leader, you are a coach, yet many leaders don’t coach very well. Before you can apply the coaching tools and models your organization suggest and provides to you, you must have the confidence to use them. Make no mistake, without the confidence to coach, you will be hesitant and less successful, plus it will be hard to instill confidence in your team members too.Join leadership expert and best-selling author Kevin Eikenberry for this interactive and practical webinar. You will gain insight into the mindset required to coach successfully, and how to build it for yourself. If you are thinking organizationally, you will leave with ideas to help your organization infuse greater confidence into your coaches. Why do the majority of salespeople struggle to have conversations with buyers that build trust and add value? Learn what science has found are the hidden, but most common, mindsets and beliefs that the majority of salespeople struggle with and discover how they impact sales performance and growth. You cannot depend on relationship-building skills alone to make the sale for you! Relationships are important, but buyers primarily want you to fulfill their needs and solve their problems. Customers do not take action unless they are challenged to take action. Learn how to avoid the amygdala hijack and how to overcome yielder Call Reluctance and close the sale. Imagine a team that’s always in fierce competition with its’ rival. It has fewer resources than its’ opponents – less money, fewer players, older equipment, less data. Yet this team has the best record in its’ league – by far. Tim will show you how you can apply the performance principles this team uses to your business and to your life. In this session, we will explore how to craft an elevator pitch which effectively communicates your ideas, so you can maximize the interest that others have in you and your business. Having a strong elevator pitch is crucial, as it could be the difference between success or failure in sales conversations, at networking events, or investor meetings. In today’s world, we’re hyper-connected, just one or two clicks away from virtually any decision maker or influencer. And so is your competition. How do you rise above the noise? How do you turn connectivity into valuable relationships -- and then into sales results? Social capital. While social capital will likely never have a line item on a P&L, modern sellers know that the quality of their relationships directly impacts their sales pipeline and overall sales results. In fact, 85% of Amy Franko’s book of business is directly attributed to her network and the quality of her social capital. In this talk, she’ll share her top frameworks and strategies with you, directly from her Amazon best-seller, The Modern Seller. As a bonus, you’ll receive the Key Relationships Inventory, to help you evaluate the strength of the key relationship types in your specific customers. Program #4 in the series Your Growth Ecosystem: Don’t Think Small About Your Big Accounts. For CEOs, Presidents, Founders/Owners, Business Development Heads, Sales VPs, and Key Account Managers of companies of any size, with special relevance to those with $10 million to $500 million in annual revenue. The series is a strategic, high-level approach to managing your organization to successfully sell and grow sales to multinational and global corporations. This program begins a 3-part unit on how structural organization will either enhance or stifle your large account sales success. Making good decisions early will improve your ability to scale as you grow. Large accounts, key accounts, global accounts by their nature require a different type of sales organization than the one that runs your everyday small and midsize accounts. For larger companies, I’ll present ideas on restructuring if that’s what you need. 1.How to structure your sales organization to meet your large account sales goals, even when you are small. 2.What organizational structures are most likely to scale. 3.Inside, outside, or both sides? How you can decide. 4.Complications in large account organizing and how to avoid them. 5.How to include channels in your sales organization. How was your last value proposition developed? A brainstorming session? Individual effort? Copying other value props? Does Sales create their own value prop, even though Marketing already has one? In over 30 years of marketing and sales experience, I have discovered there are as many ways of getting to one as there are people trying to create them. Given that most marketers or sellers rarely get training on value proposition development, it can be difficult to establish a consistent and repeatable approach. This session presents a Value Proposition Platform™ approach that is based on the preferences of decision-makers who evaluate them in their buyer journey. The pressure of deadlines, lead generation goals, and content creation can make refining a value proposition hard to fit in. Sometimes you just need to do a quick makeover to help narrow in on key targets or tweak to increase engagement. We will kick off Session 1 of the Value Proposition Masterclass by focusing on some tips and tricks to help you reboot your existing value prop to be more buyer-focused. We will look at some real value props sent in by BrightTalk Sales Expert Channel members and do some “live” makeovers to show you how to move closer to the buyer with language and focus adjustments. Getting adoption for a new process or sales methodology is not easy. That’s because changing behavior, especially organizational behavior, is hard work. - Expose some true stories and painful challenges with sales methodology adoption. - Share a logical process that has been proven to improve adoption, foster the behavior change you want to see, and improve sales force performance. - As a bonus, Mike will share one of the latest trends in sales methodology that can prepare your sales force to succeed with modern buyers in this buyers’ market. Join Mike for this webinar (where your questions are welcomed and expected) and learn how to implement a sales methodology so it sticks and delivers the sales results you want. This framework leads to more confident sales people closing more deals. In sales, as in medicine, prescription before diagnosis is malpractice. Whether the objective is to grow an account -or to grow and develop a salesperson - the discovery stage is critical to your success. Enabling a sales team for high performance requires an understanding of the wants, needs, skill gaps and behavioral tendencies for each individual salesperson. Many managers limit their effectiveness by falling back on the activities found in the CRM, but the things that lead to higher performance – attitude, motivation, sales aptitude and (the typically overlooked) soft skills – can also be measured. These analytics often reveal WHY sales representatives aren’t selling more and reaching the next level of sales performance. Mastering these metrics, and how to use them, makes it easier for managers to adapt sales coaching, development and reinforcement of sales training for maximum and sustainable impact. 1.The 10 things sales managers must know about every sales rep that you won’t find in Salesforce. 2.How sales team discovery improves the effectiveness of sales training, coaching, motivation and employee engagement. 3.Which people skills (soft skills) are most important for peak sales performance. 4.How the discovery process stacks the deck in your favor when hiring and retaining your best performers. As Leadership, you want faster sales acceleration. You spend a lot on Sales Management and Sales talent, and Sales Enablement, so why aren’t your sales growing at the pace you need? Your experience may not be in Sales, so what role should you and your Leadership team play in Sales Enablement? -pick your spots where strong Leadership and Coaching impact faster sales growth. 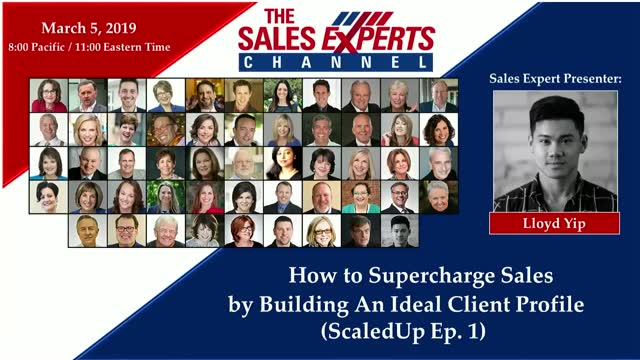 Following this webinar, you will be clear on how you can drive faster Sales Acceleration from the C-Suite by making the right adjustments to your Sales Development investment. New and on-demand content from dozens of global sales authors, speakers, researchers, coaches, trainers & thought leaders. If it's about selling, sales management or sales productivity, this channel is where you'll find it!